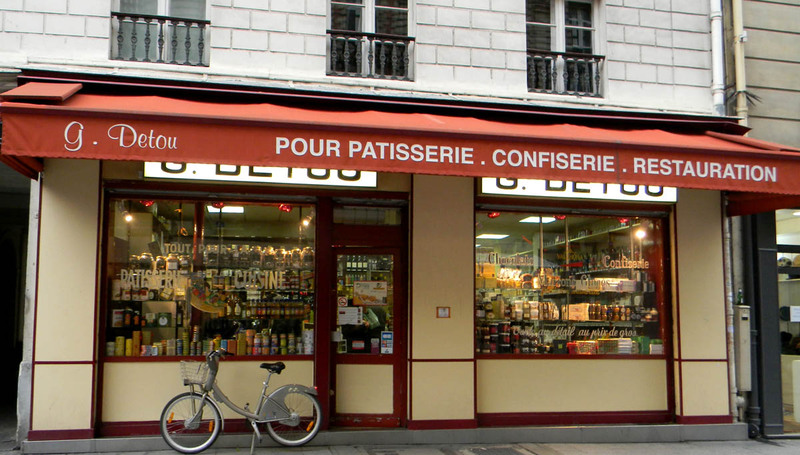 Paris is heaven for both amateur and professional patissiers (pastry chefs and bakers). 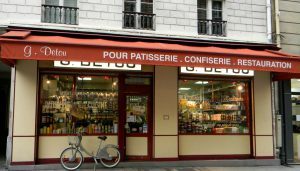 Not only are there numerous world-class pastry shops (patisseries) to try—such as Pierre Herme, Laduree, Stohrer, Sadaharu Aoki and Jean-Paul Hevin, just to name a few—but there are several culinary supply stores that are simply unsurpassed in their collections of baking equipment and ingredients. 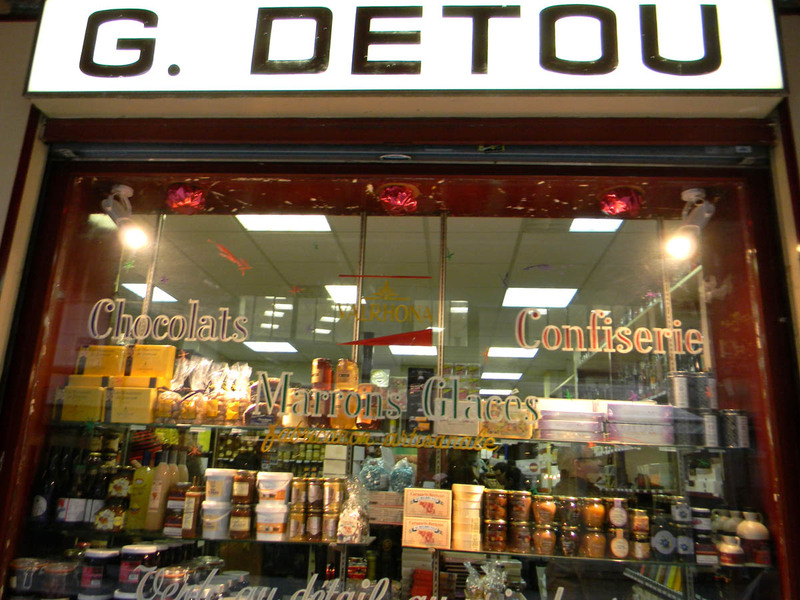 For pastry chefs looking for the highest-quality or the most unusual ingredients, the boutique of choice is G. Detou, located adjacent to the famous Rue Montorgueil shopping street. 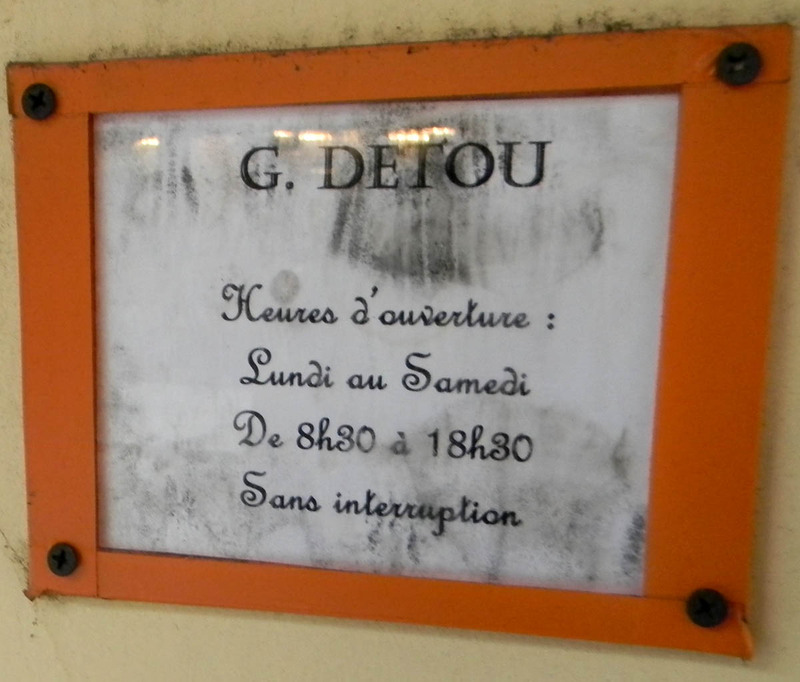 G. Detou is a homonym for the French term “I have everything”—j’ai de tout. (The letter G in French is pronounced like our letter J). And there was no mistake in choosing the shop’s name: The place literally seems to have it all. If you can’t find it here, you won’t be able to find it in all of Paris. Chocolates from across France, from candy bars to 5-kilo blocks? Mais oui! Nuts and dried fruits difficult to find elsewhere in France? Bien sur! Candied flowers, including violets and rose petals? Sans aucun doute! Nonpareils, both candy and chocolate versions? Certainement! Nappage (a clear pastry glaze)? Naturellement! You name the pastry-making ingredient, no matter how hard to find in the U.S. or elsewhere, and odds are that they’ve got it. 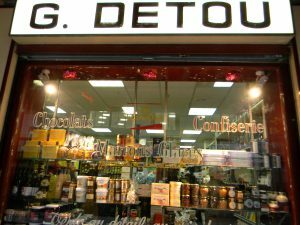 There’s also a wide array of traditional French foods (non-pastry items), such as salted butter caramels, foie gras, stone-ground mustard, tins of pate, escargots and many more—most available in the tiny shop next door. Many of these make for terrific gifts and souvenirs, so there’s always a fair amount of tourists on hand in addition to serious French cooks and bakers. 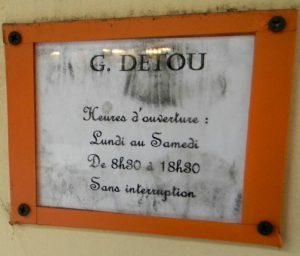 If you’re headed to such nearby culinary supply stores as Mora (the best shop for pastry-making tools) or E. Dehillerin (one of the world’s best-known suppliers of copper cookware) or even just taking in the open-air shopping along Rue Montorgueil, I strongly recommend the very short detour to G. Detou. In fact, the boutique is a destination in and of itself, particularly if you fancy yourself a patissier. But be warned! You may need an extra suitcase for all the unique items you find here. This entry was posted in Culinary Supplies, Food, French cuisine, Patisseries, Rue des Rosiers, Shopping and tagged culinary supplies, E Dehillerin, G. Detou, Mora, patisseries, patissiers, Right Bank, Rue Montorgueil, shopping by Bob Adams. Bookmark the permalink.